Aham helps you track, visualize and understand your mental health journey. Through discussing and sharing our own mental health journeys with each other, we discovered a few commonalities in what we felt we could benefit from. Oftentimes, in therapy, one of the first questions we hear is "how was your week?" The question appears simple, but the answer can be difficult. Sometimes our mind blanks, sometimes we know something happened but when prompted further we can't fully recollect the feelings, thoughts, and potential reasons. 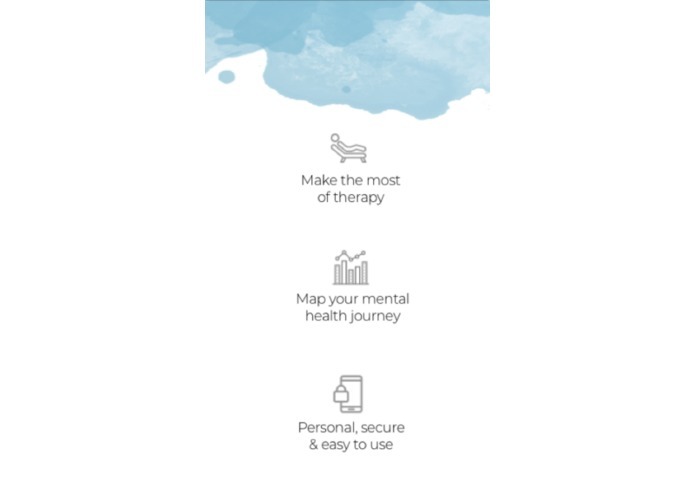 Through interviews with therapists, behavioral scientists and those currently in therapy, we identified a real opportunity to create a tool that allows users to map their mental health journey day to day, practice techniques learned in therapy, visualize their overall process, and make the most of their therapy sessions. With those goals in mind, we named our application Aham. Aham means "I" - reinforcing the belief that the healing process begins from within. 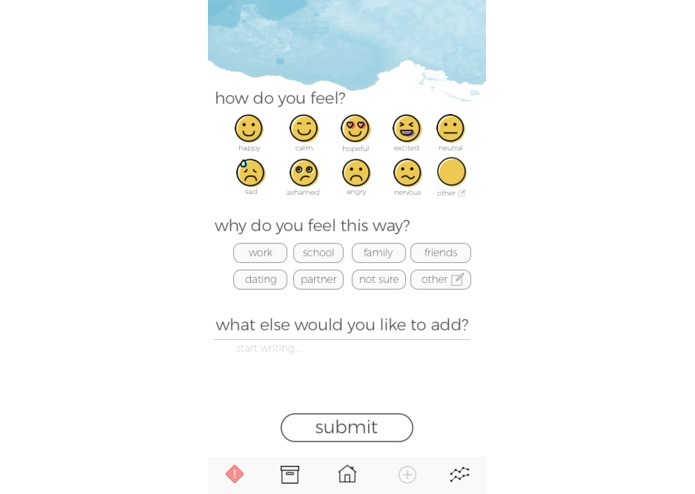 Aham is an app focused on your personal mental health journal. 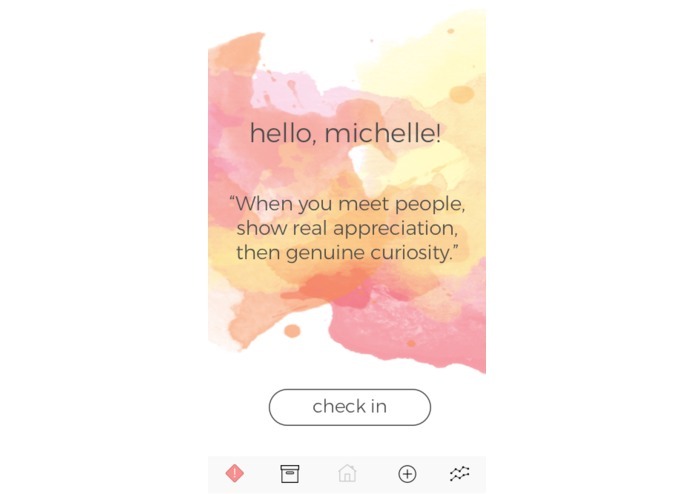 Through a series of prompted and manual check-in's, Aham asks users to label their feeling, identify a potential reason, and write their thoughts and methods of management. This data is compiled into weekly, monthly and yearly visualizations that represent their own mental health process. Aham also contains a mental health toolbox with anything the user finds helpful in managing their feelings. This can include anything from quotes in therapy and videos of loved ones offering support to playlists and comforting photos. Additionally, individuals can use Aham to share their mental health journey with loved ones. In many cases, it can be difficult to explain your experience with mental health in words - Aham provides a visual aid that can bridge the conversation and foster connection. For therapists, Aham provides a comprehensive email before each therapy session. With this email, therapists can review their clients weekly Aham check-ins, identify patterns, and receive feedback about which techniques are most effective for that specific client. Ultimately, with a fully built out platform, clinicians can also use Aham in group counseling sessions to effectively pair participants with each other. Through Aham we can lower the barrier of entry to therapy and destigmatize mental health by normalizing the process of mapping your experiences. AHAM is centered around YOU! 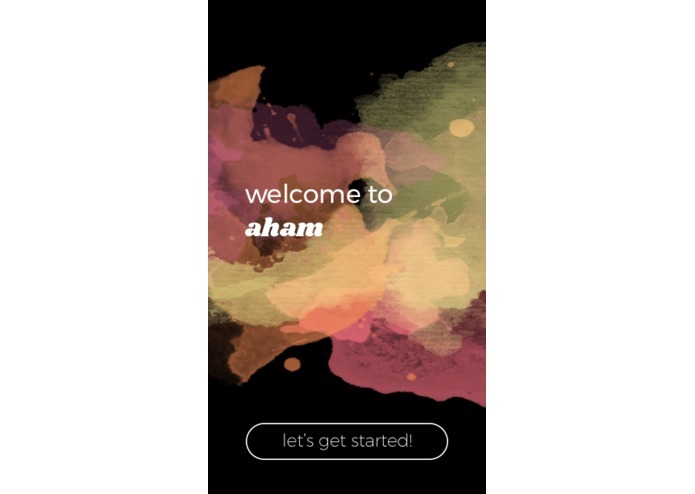 The creation of AHAM started with gathering what the user's needed and Hack for Mental Health was the best platform for that. We interviewed both therapy-takers and therapists - who shared their experiences and needs that were still unmet. Additional suggestions came from behavioral scientists at the venue, who helped us tease out our most important features. We used Sketch and InVision to put our designs together into an interactive prototype. We really want to use AHAM in a real-world scenario to test the features and get feedback from the users over a period of prolonged usage. So, time (or the lack of it) was the main challenge that we faced in prioritizing the features. The opportunity to interact with behavioral therapists and psychologists highlighted that there are multiple niche areas within mental health where technology can play a crucial role in helping users. It also enabled us to reflect that each user is unique and going on a journey in their own unique way. A powerful tool for therapists. Advanced analytics and integration with existing tools therapists use will help therapists get more profound insights into their client’s well-being. The tool would be able to highlight cases that have a change in trend or something unique, that would help therapists apply similar methods to their current cases. Sentiment Analysis. As users spend more time with Aham, the app would be able to identify the thought patterns that the users have. 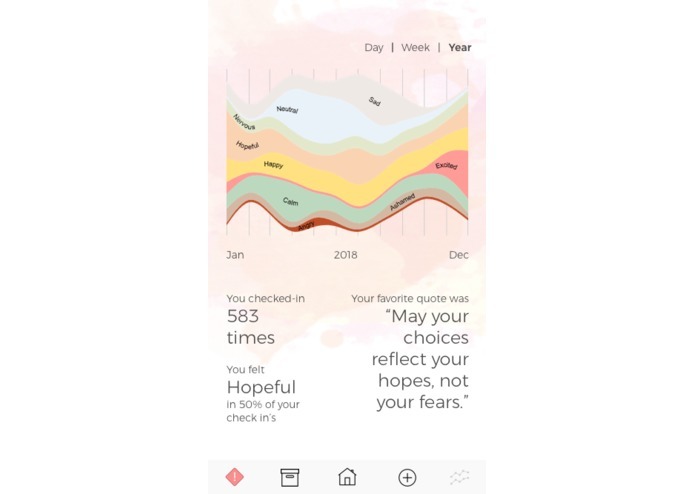 This would effectively help users track their thoughts and help recognize when they are entering negative thought patterns. I designed the mental health journey screens - both for the week and the year. My contribution was to map user's 'check-in' data to infographic visualizations. The visualizations give an effective feedback to the user about their status and also make it easy and fun to share.